Arthroscopy (also called keyhole surgery) is a common procedure that Orthopaedic Surgeons use to examine and treat conditions inside the knee joint. A fibreoptic telescope, the arthroscope, is passed through a very small incision under general anaesthetic. This allows the Surgeon to see inside the knee while surgical instruments are placed through a second small incision. In this way your Surgeon can treat conditions such as a torn meniscus cartilage, arthritis and ligament damage. A camera is attached to the arthroscope which gives the Surgeon a clear view of the inside of a joint on a video monitor. The structures of the knee joint can be injured during activities that require sudden stopping motions as well as twisting and changing of directions. This happens more easily as the cartilage becomes less supple with age. This means these injuries can happen with little or no trauma in an older patient. Common symptoms of these conditions can be swelling, persistent pain, catching or locking with certain movements and the knee giving way unexpectedly. These symptoms may be caused by a torn meniscus cartilage, a loose flap of articular cartilage or a loose body in the knee. These conditions can be treated with a knee arthroscopy. Some ligament injuries, such as an anterior cruciate ligament rupture, can also be treated with an arthroscopic procedure. This is covered in a separate information sheet. Your Surgeon will take a careful history and examination to ascertain the cause of the symptoms in your knee. This will usually be accompanied by weight bearing X-rays and sometimes an MRI Scan. In many cases non operative treatment such as physiotherapy, a knee brace, analgesics and anti inflammatories will be trialled prior to consideration of surgery. It is important to discuss the risks and benefits of surgery with your Surgeon and ask any questions you may have. You should be sure to tell your Surgeon about any allergies, medications that you take, any smoking history, any history of a bleeding disorder and any significant illnesses. Any blood thinning agents such as Warfarin should be stopped at least 5 days before your operation. You should stop any Aspirin or anti inflammatory medications 5 days prior to surgery. You can continue taking paracetamol. Under an anaesthetic a tourniquet will normally be placed around the thigh to reduce the bleeding and allow better visualisation during the operation. 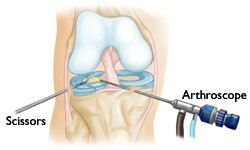 The arthroscope is inserted through a very small incision on the outer side of the knee joint. Small operating instruments are introduced through a very small second incision. The Surgeon manipulates the camera and the instruments while looking at the picture on a video monitor. This allows diagnosis, repair, reconstruction or removal of damaged tissue. The operation normally takes approximately 30 minutes. The small incisions are closed with Steri-strips and a bandage is applied to the knee. After surgery you will be returned to the Recovery Ward. You will have a bandage on the knee. Normally the Physiotherapist will assist you to get up and start walking, sometimes with the aid of crutches. You can take full weight on your leg that day and normally you will be discharged the same day. You will be given an instruction sheet to help you take care of your knee in the weeks following surgery (see separate information sheet “Patient Instructions after Knee Arthroscopy”). It is normal to have some swelling and soreness after surgery and this is best treated with rest, elevation and an ice pack. The post operative instruction sheet that you take home with you will advise you to take off the large outer bandage at 2-3 days after surgery and leave the smaller waterproof dressings on. It will also show some simple knee range of motion and strengthening exercises to begin in the days after surgery. Showering is permitted once the larger outer bandage has been removed. Painkillers will usually be prescribed to help with the first few days after surgery. Driving is normally possible between 1-5 days after the operation. You will normally see Dr Limbers for a post operative visit at approximately 10 days after surgery and at that stage the findings will be explained. He will remove the smaller waterproof dressings then. He may prescribe further physiotherapy to help with range of motion and strengthening. Much of the recovery is achieved in the first 2-3 weeks, during which period the time on your feet will be restricted. If the knee keeps getting swollen and painful during this time it may be because you are on your feet too much. Full recovery is normally 2-3 months. Most people can return to normal daily activities at 6-8 weeks after surgery. The chances of success of the operation are much higher if you maintain a healthy weight, healthy diet and an exercise program during and after your recovery. Infection – this is very rare but can be serious. Most infections are superficial, minor infections that can be treated with antibiotics. On rare occasions a deeper infection of the knee joint occurs and this requires further surgery and prolonged antibiotics. Bleeding – this could occur during or after surgery. It can cause pain and swelling after the operation. The risk is approximately 1 in 100. It may result in another operation being required to wash the blood out. Pain and stiffness – the post operative instructions will help reduce this but on rare occasions the patients have ongoing pain and stiffness after knee arthroscopy. Injury to blood vessels and nerves – this is very uncommon but can lead to chronic regional pain syndrome. Synovial fistula – on rare occasions during healing, fluid can continue to discharge from one of the skin incisions. This normally settles with a period of immobilisation and antibiotics to prevent infection. On very rare occasions further surgical treatment to close the fistula is necessary. Blood clots – this can occur in the legs (risk 1 in 750) and occasionally can move to the lungs (risk 1 in 3,000). On rare occasions this can be life threatening. The risk of death after knee arthroscopy is in the order of 1 in 100,000).